Held at the University of California, Berkeley, the course is being organized by Data Science for the 21st Century (an interdisciplinary, data science training program at U.C. Berkeley), and Geospatial Innovation Facility, (venue at Berkeley Institute of Data Science). Registration is on a first come, first served basis and will be closed when 24 participants have completed registeration. Therefore, we encourage participants to register ASAP. A waiting list will be established if registration exceeds 24 participants. The course Registration Fee includes 35 hours of class training, student supervision, course material in digital format, lectures, sample data, a Linux Virtual Machine with all the software installed. 185 GBP or 250 USD for students (Masters and PhDs) affiliated with University of California, Berkeley*. 370 GBP or 500 USD for students (Masters and PhDs) NOT–affiliated with University of California, Berkeley. 740 GBP or 1000 USD for Post-Docs, Researchers, Government Employees. 1110 GBP or 1500 USD for professionals affiliated with private and public companies and multilateral organizations. Create an account in Transferwise using https://transferwise.com/u/giuseppea101 and send from participant-currency to GBP. Using the https://transferwise.com/u/giuseppea101 link you can get a free commission transfer. You will need the spatial-ecology UK bank account that you can get by writing to Tushar Sethi (t.sethi@spatial-ecology.net) for details. This is the cheapest option! If you or your institution prefers a direct bank transfer from USD to GBP to spatial-ecology UK bank account get in touch with Tushar Sethi (t.sethi@spatial-ecology.net) for details. 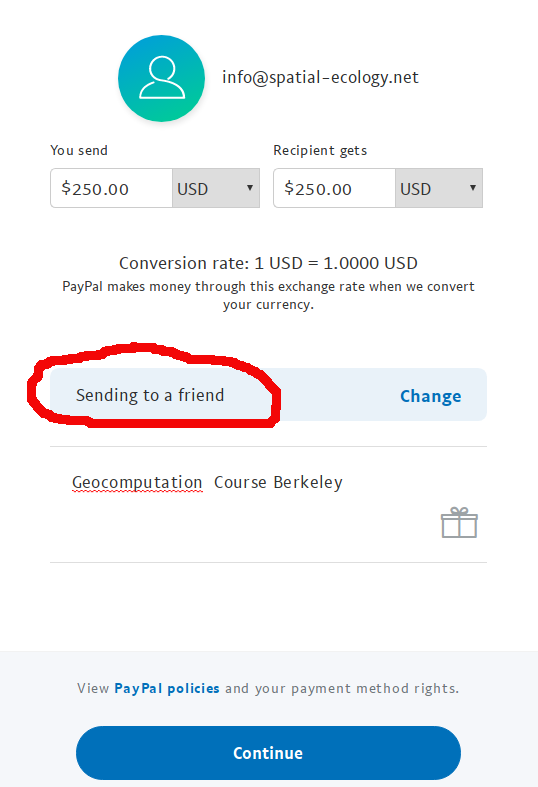 In your PayPal account, select the option Send & Request, enter the email info@spatial-ecology.net, then type the relevant amount and change the “Paying for an item or service” to “Send to Friend and Family” (see example on the right). For the lowest service fees, use the USD to USD!! transfer option. For example if you are paying from a paypal USD account, you should have a $3 fee for $500 transfer, which is the lowest option. We will not accept payment done under “Paying for an item or service” or different from the option set on the right example. If you do not see the option “sending to a friend” opt for transferwise or bank transfer. Consider that that pay with credit card using paypal is quite expensive we suggest to link your bank account to have low transfer fee. Visa requirements: Before paying the registration fee, please check your visa requirements and account for visa issuance wait times, ensuring that you are able to travel to USA in time for the Summer School. A written request for registration cancellation must be e-mailed to t.sethi@spatial-ecology.net. If registration cancellation is requested before 1 July 2018, you will receive a refund of the registration fee after deducting a processing fee of GBP 100. We will retain 60% of your fees if a cancellation request is submitted after 1 July 2018, unless a candidate from the waiting list is able to replace the withdrawing candidate.